Let’s discuss some knee anatomy and some meniscus ‘fun facts’ (Note: these facts may only be considered fun to me…)Question 1: What is the meniscus? What is its function? Probably should attribute this to Heezy1323. Get better quickly, Mr. Castro. Yes ... just for everyone to be clear ... John didn't quite post this correctly and this was written by heezy1323, our resident expert on such matters, and not by John Bonnes. In case others didn't already see/read it, heezy posted it to his blog yesterday and it was promoted to an article today. So if you have questions, direct them to heezy and not John. Great work Heezy. Glad this got promoted to a article. Good info and great read for everyone. Seriously though, this is really interesting!! Another great piece. Thanks for sharing your insights! Yes, great job on the article. Also yes, I would consider them "fun facts" about Meniscus tears as well (having had a partial removal for a tear that I suffered way back in high school). Very interesting and informative - thanks for posting this! Glad I ran before I read this today - now I am going straight to the couch and propping my knees up. Hmmm... I was not aware Castro had two prior knee surgeries before. With the third already completed, I wonder if this could shorten his catching career? Not that I think his knee will be like Sam Bradford's, but I do think it could be a concern going forward. Edited by Danchat, 17 May 2018 - 04:57 PM. This site is very fortunate to have a legitimate medical mind contributing to the forums. Thank you Heezy!!! Thank you. That was a very informative article. We could use more of these. Ugh, yes my apologies to heezy. I posted it initially under his name, but sometime when you edit a story (i fixed a mistake I made) it puts it back to my name. I just hate it when I miss that. This is the second story he has done and both have been excellent. No worries, John. Thank you for the opportunity to contribute. I'm glad folks are finding the posts interesting. I find these meniscus tears and surgeries interesting, as a high school coach. I have seen a few kids go through these procedures. The one thing that I have witnessed first hand is the fact that every single athlete who has had his meniscus repaired, (which in my career has been 6 of them), every single one of them, 6 for 6, has within weeks of being able to return to competition has re-tore that same meniscus, it has been like clockwork, no athlete that I have had with the repair has made it through the next season without it re tearing. Now on the flip side I have dealt with 8 athletes who have had meniscus removal procedure done, 5 of them were in the first 6 who had the repair the first time, so there is some crossover. Of those athletes all of them were almost back to normal within a couple of weeks? So far in my experience, it doesn't seem like the repair method has done so well for those still competing. Now it is possible that because Castro has probably one of the best doctors because he is an MLB player and all that his might work out better. But it would seem in my limited experience that 6 for 6 meniscus failure is not a good ratio. Especially for a catcher squatting down all of the time. This procedure might be 90 to 100 percent effective for a guy or gal that works in an office and just has to walk around all day. But it seems that to me once the athlete starts to put the same stressors on the injured meniscus it tends to fail again. I just wanted a more professional opinion, mine is just a layman's opinion from what I have seen happen to my athletes. I am a wrestling coach, so there is a lot of twisting and pounding going on, but it would seem that a catcher would be dealing with a lot of that himself? I thank you in advance for any extra info on this type of situation. So this is a very complex question/issue- I could probably do a two hour talk about it. No one wants to be inundated with that much ortho info by me, so I'll do my best to summarize. As discussed in the article above, the meniscus is critical for normal function of many aspects of the knee. This includes stability, cushion and protection of the surface cartilage. 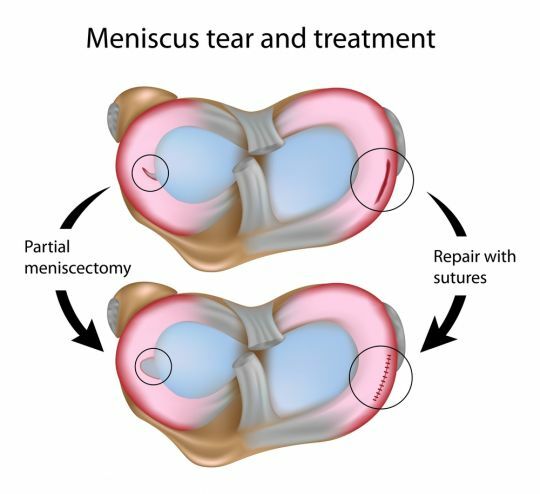 Because of the importance of the meniscus, it is critical to try to preserve as much meniscus as possible, as often as possible in order to optimize the long-term function/health of the knee. 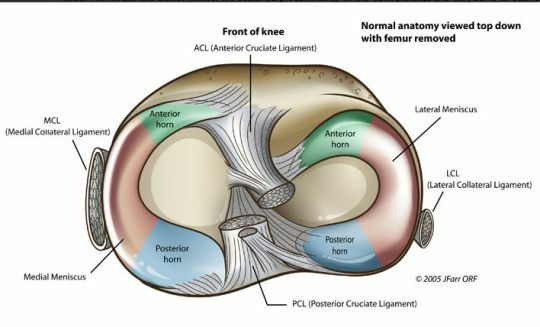 For example, we know from studies that one of the biggest risk factors for ACL graft failure after reconstruction is having had part of your meniscus removed at the same time as reconstruction. We also know that the greater the amount of meniscus removed, the greater the risk that a person develops arthritis down the road. Because of the lack of good options to treat arthritis, especially in young patients, we have become more aggressive over time at attempting to repair meniscus tears in order to prevent this problem. With regards to stability, think of the meniscus as a chock that you place behind the wheel of a trailer that is parked on a hill to prevent it from rolling away. The meniscus helps stabilize the knee in the same way. As a result, when you remove part of the meniscus during an ACL reconstruction, there is a smaller 'chock' and therefor the ACL sees higher stress and is at greater risk to fail/re-tear. In addition to our understanding of the function of the meniscus and its importance, we also have developed better tools to perform meniscus repairs more safely and easily. As a result of the above factors, the number of attempted meniscus repairs has increased dramatically over the past 10-15 years. Any time you increase the number of procedures, the number of failures also increases (by sheer volume). With respect to your specific examples noted in your post, I do have a couple of thoughts. One is, in young patients (particularly athletes) I am VERY aggressive with trying to repair any meniscus tear, because they are the patients that need their meniscus the most. If it fails, it is of course unfortunate, but removing meniscus that has a chance to heal is a bad idea, IMHO. A second thought is that there could be some technical factors in play. Studies have shown that technique is critical in repairing these tears, and it is possible that some component of the failure is attributable to this. 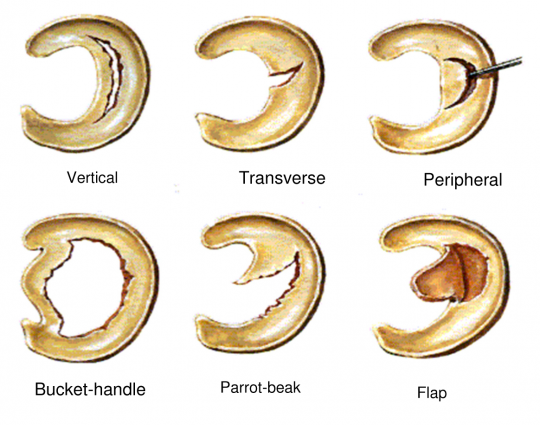 A surgeon who does many meniscus repairs is likely to be more facile with the range of techniques necessary to treat these effectively than someone who only rarely does a meniscus repair. A third thought is that some meniscus tears are much more likely to heal than others, and perhaps you are seeing a selection bias of tears that were of low likelihood to heal even under the best of circumstances. We know from other studies that generally about 70% of what we call peripheral meniscus tear repairs will heal successfully. These are the type with the best healing potential. In larger tears, such as a bucket handle tears, the success rate is around 55-60%. So you can see by these numbers, there is still a significant failure rate even in ideal circumstances. I'm sure your observations are true- in fact they are probably what I would expect to see with respect to returning to activity more easily after a partial removal. The difficulty is that with partial removal, the 'rent doesn't come due' until years later. I have a number of patients referred to me who are in their 30's or 40's and had a meniscus removal in their teens or 20's and now have arthritis. This is an extremely challenging problem to solve. Hopefully this lengthy (and likely rambling) post helps clarify the thought process. Your question is a very good one. If we knew in advance which tears would heal and which wouldn't, of course these decisions would be easier. Unfortunately, as I often tell patients, my crystal ball is a little murky.